We are excited to introduce the latest taxonomy in our Manufacturing Taxonomy Suite, the WAND Food and Beverage Manufacturing Taxonomy. If you are a food or beverage manufacturer and are already using our WAND Manufacturing Taxonomy, you can drill down even deeper with our WAND Food and Beverage Manufacturing Taxonomy. This taxonomy is designed to provide terms specific to food and beverage manufacturers and provides a foundation of 1,148 terms and 232 synonyms that can also be customized. This taxonomy includes terms relating to all aspects of Food Labeling including the individual Food Label Panels and Formats. Food Production, Food Products, Recalls, and Hazards are top level terms along with Regulatory Agencies, Food Manufacturing Laws, Food Guidance and Regulations, Standards, and Associations. Watch for our soon-to-be released WAND Packaging Taxonomy which will address the terms associated with the packaging process. 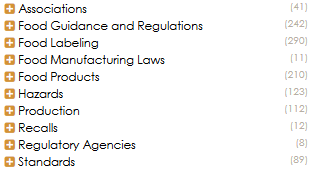 As with all WAND Taxonomies, the WAND Food and Beverage Manufacturing Taxonomy is available by itself or as part of the WAND Taxonomy Library Portal. Announcing the WAND Packaging Taxonomy.